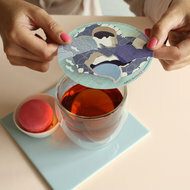 Organizing a high tea? 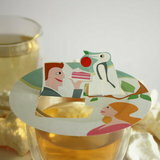 With a High Tea invitation like this everyone is right in the mood for the party. 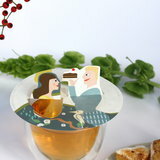 Start your high tea with a waverz or give it as a goodbye thank you to your guests. Twin CAKE is a set of two cake motifs to celebrate the extras of life. Who do you give a cherry on the cake? 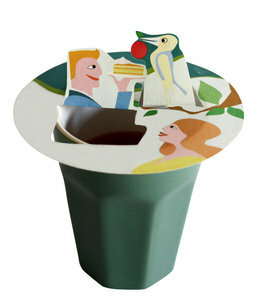 Cherry on Cake: The gentleman offers cake and the bird puts the cherry on the cake while your tea is getting the right flavor. Sit back and enjoy. A nice thank you for sweet friends and bon vivants. Cake darling? 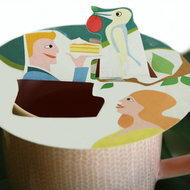 : The gentleman offers the lady a piece of cake. Is the lady seduced by the lord or the cake? Twin Waverz: holds two identical reusable Waverz. You order the twins per 6 packages to surprise more friends with the waverz. 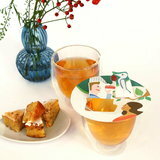 This way you can invite several friends for your tea party. You receive the waverz in color variations. Do you prefer 10 waverz in one box? Find our giftboxes.